When you have a baby, people are quick and happy to give all kinds of advice. Co-sleep. Don’t co-sleep. Cloth diaper. Don’t waste your time. Sleep train early. Rock them till they’re 12…or in college; whichever comes first. The list goes on and on. Some of this advice is really quite good and useful; some of it sounds good but is functionally impossible. Sleep when the baby sleeps? Surely you jest. That perfect specimen of all that is good in your world will grunt, squeak, and moan its way through nap time. Or worse, be silent. A silent baby is a scary baby, because now you have to get up and see if the only thing that matters in your world is still breathing. Yes, nobody naps with a newborn. This is a lie made up by the same people who have trainers and cooks to help them get back into “Pre-baby” jeans before the next awards show. I am here to tell you that none of it matters. Not one piece of advice, no matter how good you think it is, makes one lick of difference. Here’s what matters: coffee and PBS Kids. You thought I was going to say love. Nope. Love is a given. Nobody needs to tell you to love your kids. What you need to hear is that you should invest in a single-pod brewer, because when you have two kids dancing at your feet at 5:30 in the morning, after being up all night, begging for breakfast or, even worse, for you to play with them, you do not want to be messing with coffee grounds. What you want, nay need, is that hot, life-giving elixir in your hands NOW. Toss on a little “Super Why” or “Word Girl” and you are a veritable Mother of the Year. It’s like sending them to school without having to wrangle your two-year-old daughter into tights. Now go enjoy your coffee while Word Girl saves the world. You’re welcome. Kate, I love this post and agree with you! 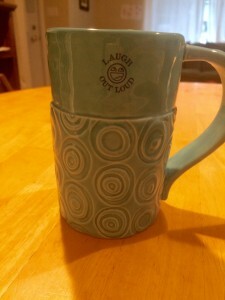 When our child was young, we relied on PBS kids and I’ve always relied on coffee! That is a winning combination. Your post made me smile. Haha–glad I’m not alone! Strength in numbers Glad to make you smile!